teksandwich.com » Saving the planet…or at least trying! Saving the planet…or at least trying! For the most part, we are all trying to do our best to lessen our effect on the environment. Even simple things like switching to compact fluorescent lights, using re-usable bags at grocery stores, etc… make a difference. One big thing I always see on TV and magazines is a water collection system. Why use our tap water for plants and cleaning when we have a naturally renewable resource…rain. I decided to look into this and see how hard it would be to implement. Because of all the recent media exposure, I figured this would be as simple as going to your local home improvement store and picking one up. Unfortunately, they didn’t have anything usable. The closest one I found was a 20 gallon tub for $100 that wasn’t even well built. When I asked an associate, they said that everyone asks for them, but they never carry it! That seems kind of ridiculous in this age of “going green”. So the next stop was a local “Mom and Pop” garden shop. After a little hunting, we found a section of water collection systems. They had some really fancy plastic containers that looked like clay urns. They looked nice, but were unnecessarily expensive ($200-300). I also found some old whiskey barrels converted to rain collectors, but again…too expensive. Time to look for an alternative. So of course I found a bunch of ideas on the internet. 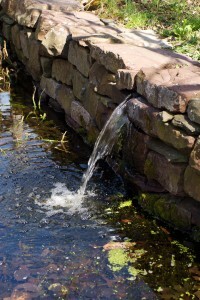 www.harvesth2o.com and www.phillywatersheds.org both have lots of great info on the topic. I was encouraged that it could be done easily and relatively inexpensively. First off, check with your local utility provider if they have a water collection program. Some will even provide the units and educate you on the topic. Unfortunately, we don’t have that option in this township. So my next stop was Craigslist. 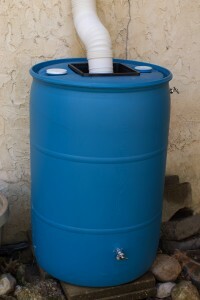 I found a few people selling empty 55 gallon barrels that have been set up for rain collection. I contacted the one closest to home and picked one up. 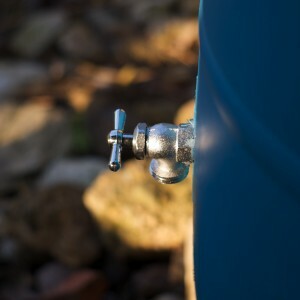 The barrel was already set up with a strainer basket, main spigot and overflow spigot. I could have gone all DIY with an empty barrel and bought all the parts, but it would have cost the same and well…this was easier. I placed the barrel directly under a gutter downspout and raised it off the ground by placing it on a stack of pavers. I then picked up a flexible gutter extender and cut the downspout to fit. To let it overflow, I cut an old hose to length and had it feed back into the the remaining lower end of the downspout. It was all pretty simple and straightforward. A few days later, we had a good amount of rain. I was surprised to see that it was filled up in less than half a day. It was all working perfectly, with the overflow draining as it was designed to and the strainer keeping out the leaves and debris. So now we have 55 gallons of water for plants and other irrigation purposes. In the end, it was well under $100 and does exactly what it’s designed to do. So the lesson here is that it’s easy to do our part to help the environment. Even the smallest thing can make an impact and you don’t have to spend a ton of money to do it. A little time spent researching and experimenting can yeild some good results. It’s worth the effort. The next project may be a composter, so stay tuned! this is fantastic! i live in an apartment but am going to start saving the water from the shower “warming up” for my plants. i think a compost pile is so great…our neighborhood has a compost drop off at the recycling center. stephen and i only put out 1 bag of trash every 3 weeks or so, and the rest is recycled or composted.